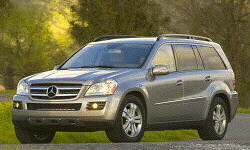 Mercedes-Benz GL Pros and Cons | Page 1 of 1 | Why Not This Car? What drives people to buy (or not buy) a certain car? TrueDelta's members share Mercedes-Benz GL pros and cons based on their real-world driving experiences. For a large, seven passenger SUV it can deliver upwards of 28 mpg on the highway. Very sleek, not too boxy. Elegant. Very smooth ride. Great use of 7 speed auto transmission. This SUV has a third row seat that can accommodate adults comfortably, without sacrificing braking and safety. Solid feel while driving and while towing an 8500 pound boat. Both dampening and braking and drift control are amazing with this truck. Beautiful interior. Impressive details and materials. It accelerates, corners, and stops like a sports car instead of an SUV but still has the ruggedness and durability of a truck.